manner, a previously-owned boat, that has been exceptionally cared for, can bring years of enjoyment. Boat buying is more than just handing over a check. Buying a boat is certainly exciting, but it can be an arduous task, one that takes knowledge, money, and a critical eye. But once the ideal boat has been found, it makes the time-consuming process worthwhile. And that is where a Certified Professionally Endorsed Yacht Brokerage firm, like Latitude, provides an invaluable service. Determine a realistic budget. Learn more about boat ownership and maintenance costs. Asking prices are just a starting point; negotiate the price down! Make an informed estimate of price on your own by using Price Guidebooks and by comparing to other boats for sale online. Variables such as condition of the boat, “curb appeal,” builder’s reputation, service history, extra equipment, engine hours, and vessel specifications will influence the given value. You may want to get pre-qualified for a boat loan before you shop. Determine where you ultimately plan to use the boat, how often, and how far you plan to travel. 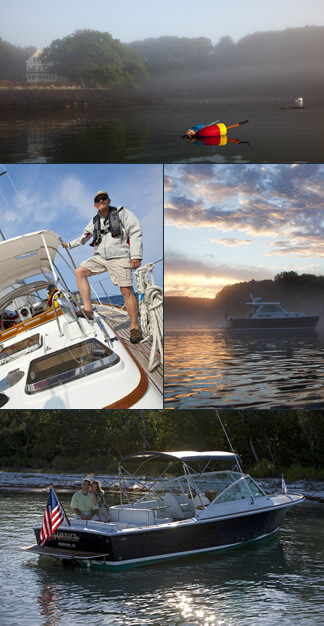 These answers will help you choose which boat is equipped with the right equipment. Where do you plan to dock or moor the boat? Do you have a special requirement for length, beam, or height? What size do you feel comfortable operating? What design do you prefer? Contemporary? Traditional? Do you plan on living on-board? Are you planning on chartering? Depending on where you intend to keep your boat, you’ll need to know the State Sales Tax requirements. There is no sales tax, use tax, property tax or tax on service on boats in Rhode Island. It is recommended to use a Certified Professional Yacht Broker, as brokers have resources available to them that are not available to most buyers. Make an offer using a Purchase and Sale Agreement with all the “subject to” items you want as purchase conditions: survey, sea trial, financing, and personal inspection. Have a marine survey and sea trial performed. Order a title search (lien search) to assure clear title. Larger recreational boats qualify for Coast Guard documentation. Smaller boats qualify for state titling (if you are in a title state) or for a Uniform Commercial Code (UCC) whereby the lien on the boat is filed with the state. Through our own extensive database and long-term industry relationships, we have the most up-to-date information at our fingertips to make sure we find exactly what you are looking for. Reviewing your goals with Latitude is very important because finding your ideal boat can be time-consuming and complex. Latitude Yacht Brokerage is pro-active in delivering a service that will ensure your new venture and boat ownership is a smooth and exciting launch toward an exciting new journey. To learn more about what a Professional Yacht Broker can do for you please click here.